Breaking bad habits requires self-control—and lots of it. Research indicates that it’s worth the effort, as self-control has huge implications for success. University of Pennsylvania psychologists Angela Duckworth and Martin Seligman conducted a study where they measured college students’ IQ scores and levels of self-control upon entering university. Four years later, they looked at the students’ grade point averages (GPA) and found that self-control was twice as important as IQ in earning a high GPA. Using your phone, tablet, or computer in bed. This is a big one that most people don’t even realize harms their sleep and productivity. Short-wavelength blue light plays an important role in your mood, energy level, and sleep quality. In the morning, sunlight contains high concentrations of this blue light. When your eyes are exposed to it directly, the blue light halts production of the sleep-inducing hormone melatonin and makes you feel more alert. In the afternoon, the sun’s rays lose their blue light, which allows your body to produce melatonin and start making you sleepy. By the evening, your brain doesn’t expect any blue light exposure and is very sensitive to it. Most of our favorite evening devices—laptops, tablets, and mobile phones—emit short-wavelength blue light brightly and right in your face. This exposure impairs melatonin production and interferes with your ability to fall asleep as well as with the quality of your sleep once you do nod off. As we’ve all experienced, a poor night’s sleep has disastrous effects. The best thing you can do is to avoid these devices after dinner (television is OK for most people as long as they sit far enough away from the set). Impulsively surfing the Internet. It takes you 15 consecutive minutes of focus before you can fully engage in a task. Once you do, you fall into a euphoric state of increased productivity called flow. Research shows that people in a flow state are five times more productive than they otherwise would be. When you click out of your work because you get an itch to check the news, Facebook, a sport’s score, or what have you, this pulls you out of flow. This means you have to go through another 15 minutes of continuous focus to reenter the flow state. Click in and out of your work enough times, and you can go through an entire day without experiencing flow. Checking your phone during a conversation. Nothing turns people off like a mid-conversation text message or even a quick glance at your phone. When you commit to a conversation, focus all your energy on the conversation. You will find that conversations are more enjoyable and effective when you immerse yourself in them. Using multiple notifications. Multiple notifications are a productivity nightmare. Studies have shown that hopping on your phone and e-mail every time they ping for your attention causes your productivity to plummet. Getting notified every time a message drops onto your phone or an e-mail arrives in your inbox might feel productive, but it isn’t. Instead of working at the whim of your notifications, pool all your e-mails/texts and check them at designated times (e.g., respond to your e-mails every hour). This is a proven, productive way to work. Saying “yes” when you should say “no.” Research conducted at the University of California in San Francisco shows that the more difficulty that you have saying no, the more likely you are to experience stress, burnout, and even depression, all of which erode self-control. Saying no is indeed a major self-control challenge for many people. “No” is a powerful word that you should not be afraid to wield. When it’s time to say no, emotionally intelligent people avoid phrases like “I don’t think I can” or “I’m not certain.” Saying no to a new commitment honors your existing commitments and gives you the opportunity to successfully fulfill them. Just remind yourself that saying no is an act of self-control now that will increase your future self-control by preventing the negative effects of over commitment. Thinking about toxic people. There are always going to be toxic people who have a way of getting under your skin and staying there. Each time you find yourself thinking about a coworker or person who makes your blood boil, practice being grateful for someone else in your life instead. There are plenty of people out there who deserve your attention, and the last thing you want to do is think about the people who don’t matter when there are people who do. Multitasking during meetings. You should never give anything half of your attention, especially meetings. If a meeting isn’t worth your full attention, then you shouldn’t be attending it in the first place; and if the meeting is worth your full attention, then you need to get everything you can out of it. Multitasking during meetings hurts you by creating the impression that you believe you are more important than everyone else. Gossiping. Gossipers derive pleasure from other people’s misfortunes. It might be fun to peer into somebody else’s personal or professional faux pas at first, but over time, it gets tiring, makes you feel gross, and hurts other people. There are too many positives out there and too much to learn from interesting people to waste your time talking about the misfortune of others. Comparing yourself to other people. When your sense of pleasure and satisfaction are derived from comparing yourself to others, you are no longer the master of your own happiness. When you feel good about something that you’ve done, don’t allow anyone’s opinions or accomplishments take that away from you. While it’s impossible to turn off your reactions to what others think of you, you don’t have to compare yourself to others, and you can always take people’s opinions with a grain of salt. That way, no matter what other people are thinking or doing, your self-worth comes from within. Regardless of what people think of you at any particular moment, one thing is certain—you’re never as good or bad as they say you are. 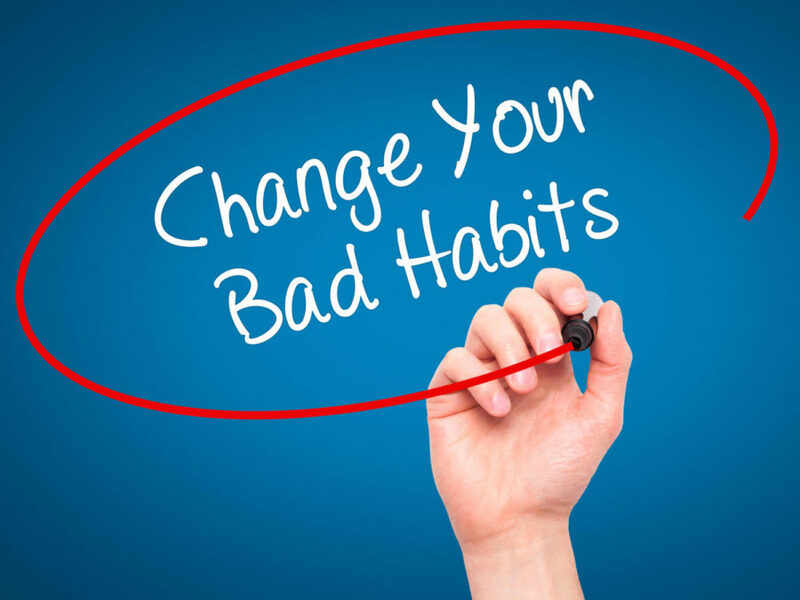 By practicing self-control to break these bad habits, you can simultaneously strengthen your self-control muscle and abolish nasty habits that have the power to bring your career to a grinding halt. Creative and proactive marketing professional with positive approach and desire for successful marketing career – Confident in ability to propose own ideas when appropriate, possessing strong initiative and drive to success.